There are several options for diagnosing issues with Durable Functions. Some of these options are the same for regular functions and some of them are unique to Durable Functions. Application Insights is the recommended way to do diagnostics and monitoring in Azure Functions. The same applies to Durable Functions. For an overview of how to leverage Application Insights in your function app, see Monitor Azure Functions. The Azure Functions Durable Extension also emits tracking events that allow you to trace the end-to-end execution of an orchestration. These can be found and queried using the Application Insights Analytics tool in the Azure portal. 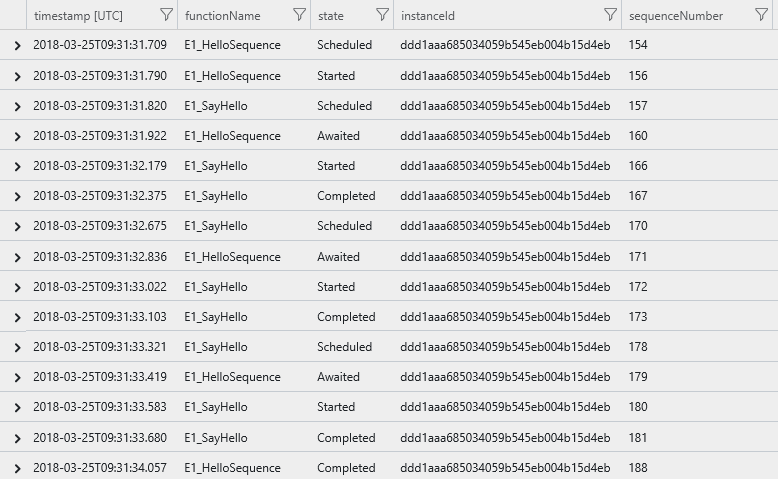 Each lifecycle event of an orchestration instance causes a tracking event to be written to the traces collection in Application Insights. This event contains a customDimensions payload with several fields. Field names are all prepended with prop__. hubName: The name of the task hub in which your orchestrations are running. appName: The name of the function app. This is useful when you have multiple function apps sharing the same Application Insights instance. slotName: The deployment slot in which the current function app is running. This is useful when you leverage deployment slots to version your orchestrations. functionName: The name of the orchestrator or activity function. functionType: The type of the function, such as Orchestrator or Activity. instanceId: The unique ID of the orchestration instance. Scheduled: The function was scheduled for execution but hasn't started running yet. Started: The function has started running but has not yet awaited or completed. Awaited: The orchestrator has scheduled some work and is waiting for it to complete. Listening: The orchestrator is listening for an external event notification. Completed: The function has completed successfully. Failed: The function failed with an error. reason: Additional data associated with the tracking event. For example, if an instance is waiting for an external event notification, this field indicates the name of the event it is waiting for. If a function has failed, this will contain the error details. isReplay: Boolean value indicating whether the tracking event is for replayed execution. extensionVersion: The version of the Durable Task extension. This is especially important data when reporting possible bugs in the extension. Long-running instances may report multiple versions if an update occurs while it is running. sequenceNumber: Execution sequence number for an event. Combined with the timestamp helps to order the events by execution time. Note that this number will be reset to zero if the host restarts while the instance is running, so it's important to always sort by timestamp first, then sequenceNumber. The verbosity of tracking data emitted to Application Insights can be configured in the logger (Functions 1.x) or logging (Functions 2.x) section of the host.json file. By default, all non-replay tracking events are emitted. The volume of data can be reduced by setting Host.Triggers.DurableTask to "Warning" or "Error" in which case tracking events will only be emitted for exceptional situations. By default, Application Insights telemetry is sampled by the Azure Functions runtime to avoid emitting data too frequently. This can cause tracking information to be lost when many lifecycle events occur in a short period of time. The Azure Functions Monitoring article explains how to configure this behavior. | where customDimensions.Category == "Host.Triggers.DurableTask"
The result is a list of tracking events that shows the execution path of the orchestration, including any activity functions ordered by the execution time in ascending order. The following query displays the status of all orchestration instances that were run in a specified time range. The result is a list of instance IDs and their current runtime status. Remember that while the logs claim to be calling F1, F2, and F3, those functions are only actually called the first time they are encountered. Subsequent calls that happen during replay are skipped and the outputs are replayed to the orchestrator logic. If you want to only log on non-replay execution, you can write a conditional expression to log only if IsReplaying is false. Consider the example above, but this time with replay checks. The custom status payload is limited to 16 KB of UTF-16 JSON text because it needs to be able to fit in an Azure Table Storage column. You can use external storage if you need larger payload. Replay: Orchestrator functions regularly replay when new inputs are received. This means a single logical execution of an orchestrator function can result in hitting the same breakpoint multiple times, especially if it is set early in the function code. Await: Whenever an await is encountered, it yields control back to the Durable Task Framework dispatcher. If this is the first time a particular await has been encountered, the associated task is never resumed. Because the task never resumes, stepping over the await (F10 in Visual Studio) is not actually possible. Stepping over only works when a task is being replayed. Messaging timeouts: Durable Functions internally uses queue messages to drive execution of both orchestrator functions and activity functions. In a multi-VM environment, breaking into the debugging for extended periods of time could cause another VM to pick up the message, resulting in duplicate execution. This behavior exists for regular queue-trigger functions as well, but is important to point out in this context since the queues are an implementation detail. When setting breakpoints, if you want to only break on non-replay execution, you can set a conditional breakpoint that breaks only if IsReplaying is false. By default, Durable Functions stores state in Azure Storage. This means you can inspect the state of your orchestrations using tools such as Microsoft Azure Storage Explorer. This is useful for debugging because you see exactly what state an orchestration may be in. Messages in the queues can also be examined to learn what work is pending (or stuck in some cases). While it's convenient to see execution history in table storage, avoid taking any dependency on this table. It may change as the Durable Functions extension evolves.